Published by Cyril Huze September 11th, 2015	in Builders, Editorial and Events. Riders with a serious devotion to the road, you can rejoice. Harley-Davidson announced last weekend return of its long-mileage specialist, the 2016 Road Glide® Ultra motorcycle. 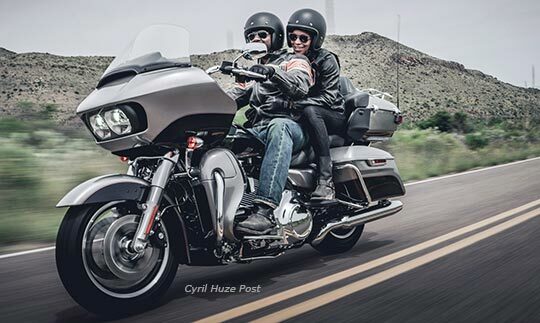 A two-year absence from the Harley-Davidson Touring line was time well spent infusing the Road Glide Ultra with enhanced style, comfort and performance – the full influence of the customer-led Project RUSHMORE product development effort. Rider and passenger will enjoy outstanding aerodynamics and optimized touring ergonomics propelled by the performance of the Twin-Cooled™ High Output Twin Cam 103™ powertrain. The distinctive design of the frame-mounted Road Glide® fairing was created by Harley-Davidson stylists and engineers using computational fluid dynamics, hundreds of hours of development in a wind tunnel and thousands of miles of road testing. Integrated triple splitstream vent openings in the fairing work in concert with the 13.5-inch tall touring windscreen to manage air pressure between the fairing and the rider to virtually eliminate head buffeting. Mid-frame air deflectors mounted below the fairing help to maintain comfortable airflow around the rider and direct cooling air to powertrain components. Because the fairing is mounted to the frame, the effect of its weight and impact from the wind are reduced through the handlebars, resulting in light, precise steering control. 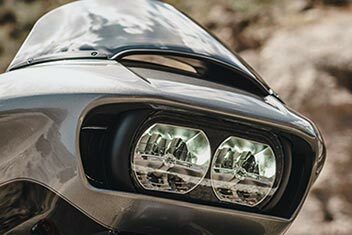 The fairing also holds Dual Reflector Daymaker™ LED headlamps, a distinctive and conspicuous styling element that punches farther through darkness with brilliant white high- and low-beam illumination. The rider triangle is unique to the Road Glide Ultra model and designed to put a wide range of riders in a position that’s ideal for long-haul touring comfort. 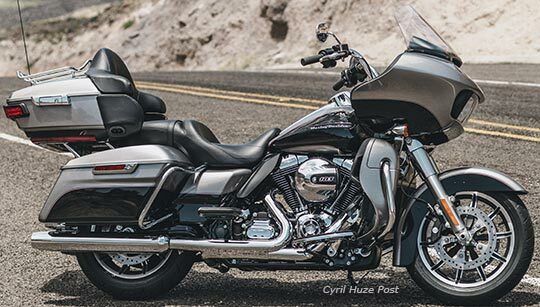 The 1.25-inch diameter handlebar is positioned 1.9 inches higher than Road Glide® and Road Glide Special® models to optimize long-range touring comfort, and the seat shape is revised and slightly lower. The 2016 Road Glide Ultra features all of the Project RUSHMORE innovations and technology enhancements that have collectively transformed the Harley-Davidson Touring platform, including stout 49mm forks, Reflex™ Linked Brakes with ABS, sleeker fenders, lighter Enforcer cast aluminum wheels and improved instrument graphics and hand controls. Cruise control is also standard on the Road Glide Ultra. 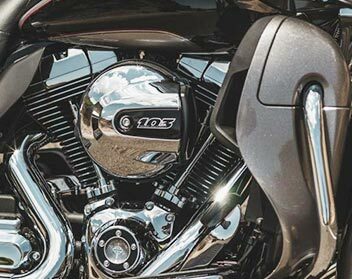 Touring performance demanded by Road Glide Ultra riders is provided by the Twin-Cooled™ High Output Twin Cam 103™ powertrain. A combination of air-cooled and precision liquid cooling strategies allows the engine to maintain peak performance under the most demanding loads and riding conditions, and enables a higher 10.1:1 compression ratio for increased power and efficiency, including 10.7 percent more peak torque than the standard Twin Cam 103™ engine. Coolant circulates through the cylinder heads in the area around the exhaust valves and through heat exchangers located in the left and right fairing lowers. The precision cooling system is thermostatically controlled and uses an electric pump to circulate coolant. The Road Glide Ultra is equipped with the BOOM! ™ Box 6.5GT infotainment system with color touch screen, GPS and Bluetooth capability. Mounted in a reshaped inner fairing, the 100-watt BOOM! 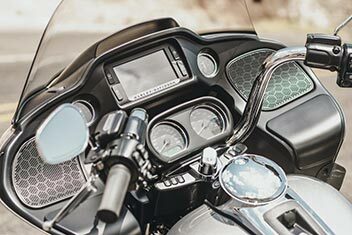 ™ Box 6.5GT is now located two inches closer to the rider compared to previous models for enhanced visibility of the high-resolution screen and an easier reach to the faceplate buttons. 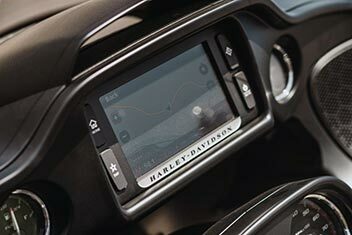 All infotainment functions are controlled through thumb-operated five-way joysticks located on the left and right hand controls or the touchscreen. Four 5.25-inch speakers are optimized to the system and mounted in sealed-and-tuned enclosures. Equalization is optimized for the motorcycle environment and automatically adjusts the bass and treble levels to the selected volume for optimal sound quality at all riding speeds. Fairing storage space includes a rubber-lined Jukebox media compartment with USB connection in the right side of the inner fairing. Restyled luggage includes sleeker hard saddlebags and a new Tour-Pak® luggage shape that offers 4 percent more capacity than the previous design. The Tour-Pak is topped with a chrome tubular luggage rack. The saddlebags and Tour-Pak are equipped with One-Touch latches, a signature design feature of Project RUSHMORE, for easy one-handed opening or closing. The new 2016 Harley-Davidson® motorcycles and accessories start rolling into Harley-Davidson® dealerships immediately. the antithesis of what a motorcycle should be. I bought my FLTRU when the 2013 models hit the dealers in 2012 knowing HD was going to stop building them for a year or two. The handling is phenomenal for a bike weighing over 900 pounds. If you don’t believe me, just try keeping up with me in the twisties. I’ve been relegated to riding with guys on sport bikes ’cause my HD buddies on their soft tails and fork mounted fairing bikes can’t keep up. Now I wish I had all the upgrades that are on the 2016 model. I won’t buy one though until HD gets rid of the outdated headset cable and provides full bluetooth capabilities. Well, if motorcycling is such a banal experience that ya need extra audio-stimulation…. perhaps you aught to be thinking about driving a car instead….??? The RG is the only HD uber-tourer that “moves” towards the league of the Gold Wings and the BMW KT1600GTL. However, HD should have a single (frame mount) fairing that stretches from the floor boards to the top – rather than a parts-bin things that shares 90% plus bits with the Electra (that is just cheapskate). Thank you for pointing that out. Biggest pet peeve for me as well. But yet individuals posting here praise the SH#&^ out of it. So then what was it called last year? As I recall it disappeared in 2014 and came back last year. It was called Road Glide for the 2015 model year as well. A Soft tail can’t keep up to a 900 lb. tank in the twisties? Hmm, maybe you ride with old ladies. Fully packed and fueled, your getting onto half a ton of motorcycle. The “base” Road Glide” would likely be about 900+. Rode two with 120R motors; the kind of power they should have with that weight. Excellent on freeways and more “open” backroads. Was surprisingly agile thru the Dragon, even with a passenger…but I’ll keep my Fat Bob for solo touring; still no comparison to an R1200RT. None. Sometimes I actually miss my TourGlide…By the way, the lowers were attached to the fairing way back then…. The lowers help keep your feet warm and dry in the wet months, but the bikes look so much better without the pantaloons installed. Not to mention, it’s nice to have your knees in the breeze when it’s warm. In reading the comments I saw 2 ways to make money. An adapter for Bluetooth and a clear adjustable wing between the fairing and lowers. “The Shark Nose” wasn’t exactly welcomed by the HD community back in the day when if first came out but has since then had a lot of converts. When looking at the dash I wonder how it keeps water out of places like the speakers when it rains. @Spacedawg I know what you mean about the Road Glide handling so much better than other offerings from the Motor Company, it’s the best bike they build… as far as keeping up in the twisties goes I’ll take an Indian Chieftain any day. For a full size bagger that bike is hard to beat. seymour…$54,000. ???? List starts at $26,699. Trade it was enough to pay off his load & put a down payment on the Road Glide. He got about 10 miles of the 90 mile drive back home when his back started to hurt. I know 1 guy that is not true for, despite what all of the magazines & custom guys say …. Spacedawg – Have you sold that ocean front property in Kansas yet ?